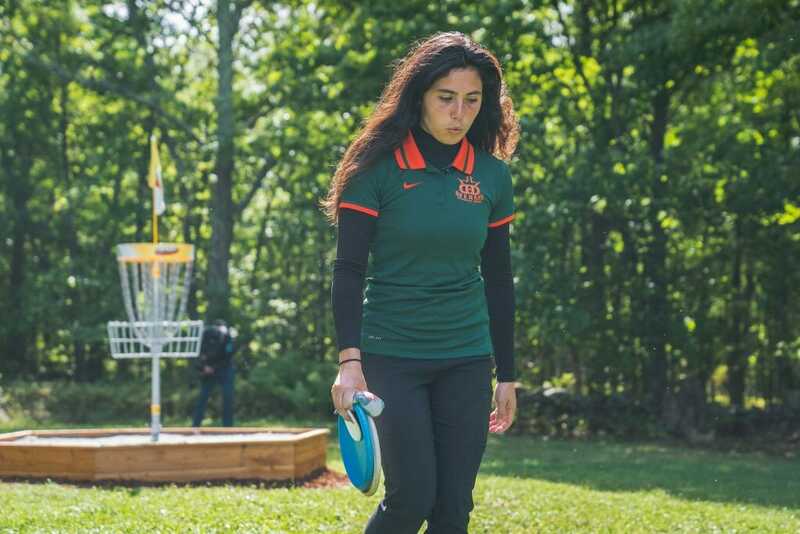 The term “game plan” gets overused by disc golf pros. 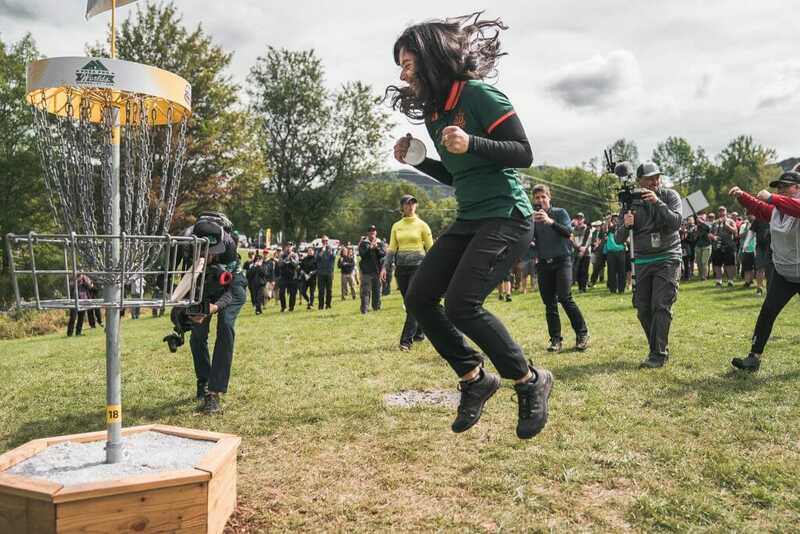 But we’re going to make an exception for Paige Bjerkaas, as she had a true strategy that separated her from the field early at the PDGA Professional World Championship and helped her to victory. Bjerkaas shot an even par 63 round on Fox Run Meadows Sunday and claimed her first world title by a comfortable six strokes. After Paige Pierce had made up seven strokes on Bjerkaas Saturday, it looked like Sunday would offer some late excitement, but Bjerkaas cleaned up her game and Pierce didn’t have enough magic left in her. When the lead card made the long walk from hole 12 to hole 13, Bjerkaas had an eight stroke lead. It felt nearly over at that point, and when she parred each of the next three holes and took a nine stroke advantage into the final three, she had it all wrapped up. Pierce never was able to really put pressure on Bjerkaas during the round. Through the first five holes, Pierce had only fallen further back of Bjerkaas’ lead. When Bjerkaas’ drive on the very birdie-able hole 6 went OB, she did cough up two strokes, but Pierce returned the favor on hole 7. The long par 5 gave Pierce fits all weekend. She shot 7-over par on it over the three rounds at Fox Run, and if it weren’t for some luck on Sunday, that number would have been higher. That reopened a seven stroke lead for Bjerkaas, before Pierce quickly recovered and seemed to begin making her final push for the top spot over the next three holes. She birdied each of them, and gained two strokes on the lead in the process. Pierce couldn’t keep the run going though, when she found OB on hole 11 as she griplocked her approach into the wooded green. Bjerkaas birdied the same hole. She may not have gone OB on hole 12, but she did miss her par putt from inside Circle 1 to take another bogey. Those two holes are what gave Bjerkaas her eight stroke lead heading into the final stretch, and they also derailed the momentum Pierce had begun to mount. At that point it would have taken a serious collapse from Bjerkaas to lose, even if Pierce did something special. Neither of those things happened and Bjerkaas was able to play it safe the rest of the way and finish with one of the most comfortable World Championship wins in recent memory. Bjerkaas finished the tournament at 6-over par 317 total. Pierce’s final day 1-over par 64 would push her to 12-over par 323 total and a second place finish. Bjerkaas didn’t do anything crazy to get that sizable win. In fact, she went out of her way to not do anything crazy. Her even par round gave her an even score overall on her three rounds at Fox Run, and that was her goal. While everyone else struggled to keep shots in bounds, Bjerkaas disced down, kept it conservative, and played it safe all the way to a world title. Once Pierce was out of the running in the last few holes, there was no one else to push Bjerkaas. Jessica Weese and Catrina Allen both had nice 1-under par 62 final rounds to tie for the hot round on Sunday, but were out of it by that time. Sarah Hokom and Rebecca Cox, who were on lead card with Pierce and Bjerkaas, shot themselves out of the running by the back nine. Hokom would finish in a tie for third with Weese at 19-over par 330 total. Cox was fifth and Allen sixth. So Bjerkaas is the 2018 world champion. And in the final moments of the tournament, as she was walking down the fairway on hole 18, she said all she could think about was joining the all-time greats of the game that had inspired her to get to that moment. “I’ve been playing disc golf for 11 years. I remember watching Valarie [Jenkins] win her world title and thinking, ‘Wow, I want to do that one day.’ And I did it,” she said. With her consistent, and impressive play all week long,2 Bjerkaas became a very deserving member of that same, storied group with her first World Championship win. Comments on "Bjerkaas Commanding On Way To First World Championship"